Currently, there are manyFinishing materials for walls, starting from the most simple and accessible, to elite and very expensive. However, for many years a classic wall decoration premises are wallpaper. Their diversity creates certain difficulties. 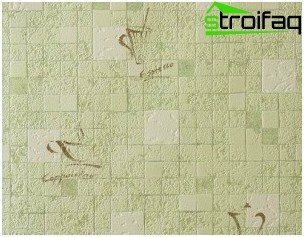 Therefore, solving the problem of how to select the wallpaper, you must clearly know the basic types, advantages, disadvantages, and operating characteristics. How to choose wallpaper for the different rooms? What to look for when buying wallpaper? 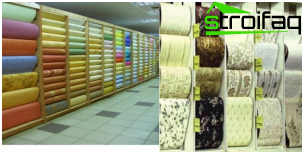 The market is replete with decorative materials wallpaper onevery taste and budget. That is why the result can not be a complete classification of wallpaper, but it is really to identify the main criteria on which they are divided into types. Ordinary wallpaper that do not involve any cleaning other than dry, so they do not have water-resistant coating. Waterproof wallpaper. Small soiled areas can be cleaned with a slightly damp sponge or cloth. Never use detergents or cleaners. Washable wallpaper. This type of finishing materials it is able to withstand wet cleaning with household detergents. Supermoyuschiesya wallpaper extremely resistant even to frequent wet treatments. In addition to soft cloth or sponge, you can even use a brush. Relief. Even in the production process is applied to the surface of wallpaper embossed. These wallpapers can be embossed or corrugated. Simulating the texture of a material. Externally, these wallpapers are no different from the brick masonry, plaster or any other finishing material. Light wallpaper, which weighs less than 110 g / m2. Heavy wallpaper. Most often, such differs multilayer finishing material, and ensures that the weight of 110 g / m2 or more. Obviously, these classifications are rather relative, as every year the market of finishing materials there are new types of wallpaper. Today, wallpaper is arolled finishing material with a different basis on which to apply this or that decorative coating. Apply the material to the walls with a special wallpaper paste. 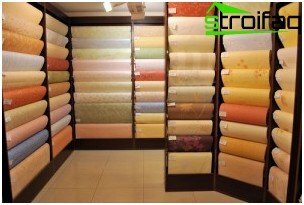 Therefore, the most reasonable to the classification of the wallpaper, depending on the manufacturing technology and the fundamentals. When deciding what to choose wallpaper, first of all weWe remember the classic paper wallpaper. Accepted provide single and dual-layer paper wallpaper. The first is quite simple - it is a layer of paper coated with a pattern. Double analogs are characterized in that the first layer is the base layer and the second - a decorative coating, which is patterned. Obviously, the paper wall is sufficientlycost-effective option, as have many drawbacks. They are durable, easy to burn in contact with them to sunlight, they can not be subjected to wet cleaning. In addition, when paper wallpaper pasting all the irregularities of the walls and their flaws are visible to the naked eye. However, paper wallpaper - ideal whenthe presence in the house of small children who love to draw. Spoiled finishing material would not mind to replace in the near future that would not entail great expense. This type of wallpaper is characterized by the presence of two layers -bases and the decorative layer, which is patterned. A feature of this material is that used for the base fabric or strong paper. In the latter case, the wallpaper is called textile. The top layer is a film made of polyvinyl chloride. Vinyl wallpaper feature superiorperformance: they are strong enough, resistant to various mechanical damage, easy to wet cleaning, environmentally friendly and durable. 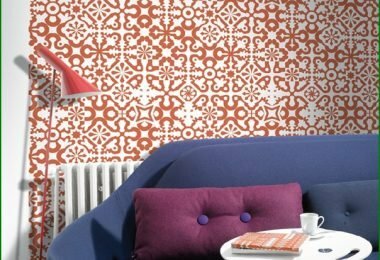 The variety of decorative coatings for vinyl wallpaper allows you to create the room necessary visual effects and place your accents. However, buying vinyl wallpaper, it is worth remembering that they are airtight. After pasting of walls do not "breathe", so in the room will have to regularly monitor the level of humidity. So, how to choose the wallpaper for the walls, whichIt supposed to be painted? 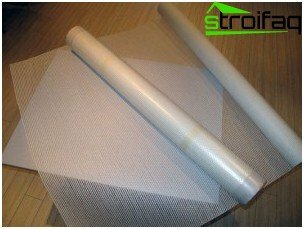 For this ideal finishing material, based on available Non-woven layer. Wallpaper on the basis of strong non-woven and have good zvukoizoliruemostyu and the absence of unwanted stretch marks by pulling on the wall. 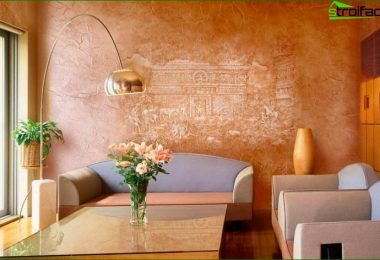 This type of wallpaper is ideal for paintingwalls for the reason that they conceal even large enough flaws, making it difficult to achieve when applied directly to the surface of the wall. 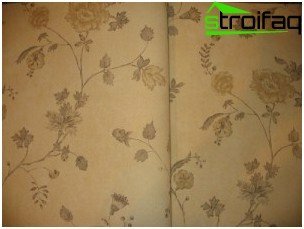 In addition, non-woven wallpaper involve multiple staining that is extremely convenient, as there is no need to remove old layers of paint from the surface of the wall. Solving the problem of how to choose a wallpaperpainting, you can opt for the non-woven wallpaper for another reason. 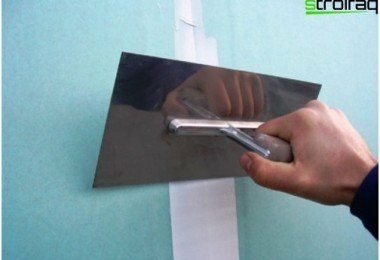 The fact that they already have a layer of adhesive that allows to apply the adhesive only on the wall surface. Furthermore, this type of coating material can easily be removed from the wall if necessary. The basis of this decorative material are glass fiber yarns. 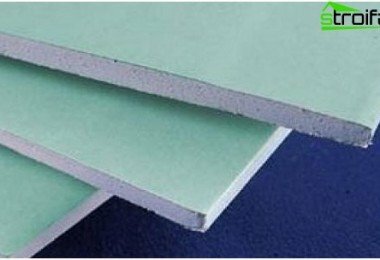 Glass fiber may have one or two layers, moreover, their surface can also be different - smooth or grooved. 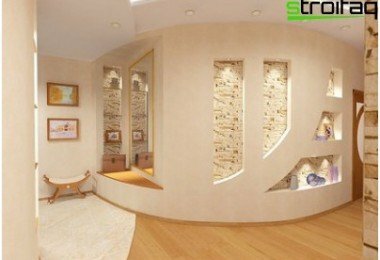 For the manufacture of this type are used wallpaperOnly environmentally friendly raw materials, making it completely safe in operation. 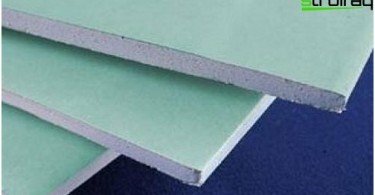 Opt for fiberglass, do not have to worry about the appearance and propagation of various microorganisms in them, since no culture medium for them simply is not there. Glass fiber have excellentcharacteristics: they are durable, strong, virtually tear. It is worth noting that after the stickers on the wall need to be painted with acrylic or latex paint. The finished coating is able to serve over the years, but in a residential area, they are rarely used. In most cases only as a decoration original element in any part of the wall. The problem of how to choose the wallpaper for thata room, sooner or later confronts anyone. Obviously, there are some nuances, which account allows you to choose a finishing material as efficiently as possible. All of the rooms in a residential area characterized by a degree of functionality and purpose, so they selected a variety of wallpapers. In this room, I decided to gather the whole family andwelcome guests. 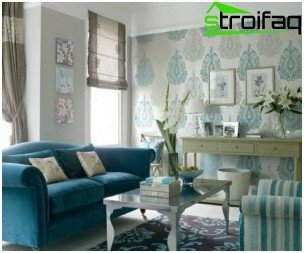 Functional living load is extremely high, so approach the issue of choice of wallpaper for it is with special attention. So, they must comply with style solution space. If it Ecostyle, the wallpaper should be chosen from natural materials. The best option would be textile wall. Wallpaper for the living room should be easy to cleanand a high degree of strength. It is necessary to take into account the degree of brightness of the room. It is not necessary to acquire the dark wallpaper for the living room with poor natural light or heavy curtains. In the bedroom, definitely need to createan atmosphere of peace and comfort. Wallpaper play this role. Most often chosen wallpaper for the bedroom light and muted tones. You can use wallpaper with a small figure, but you can safely choose the wallpaper with large, but not fanciful images in the presence of a large space. Entrance hall - is the part of the dwelling, wherethe possibility of contamination of finishing materials is maximized. That is why the wallpaper for the hallway must be water-resistant, so they can easily be subjected to thorough wet cleaning and durable. In addition, the wallpaper for the hallway often choosedark shades. The reason is the same - a large concentration of dust and dirt. 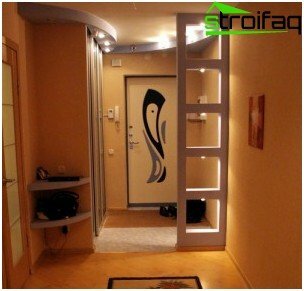 However, it is in this case provided in the hallway sufficient amount of artificial light sources. The fact that the dark hallway wallpaper will give darkness and visually it will narrow. 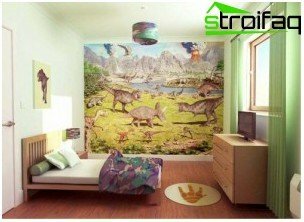 Children's mentality is very mobile and receptive,so to solve the problem of how to choose the wallpaper for that room should be particularly careful. Currently, there are plenty of children's wallpaper with images of favorite cartoon and fairy tale characters. Color wallpaper should not be too bright. In this room the child will be difficult to focus, it will be irritable and whiny. However, the final choice of wallpaper will depend on the child's temperament. Deciding what kind of wallpaper needed for a particularroom, we go to the store. At this stage, experts recommend pay attention to a number of nuances. In particular, choosing wallpaper, you must take into account the fact that the trading floor lighting is different from the lighting in the living room. This means that the tone wallpaper subsequently may differ slightly. In addition, buying a fairly large amount ofrolls, you must check the batch number to have been the same. Differences in the party room can lead to the fact that on one wall will be pasted wallpaper in different shades. Each roll of wallpaper has a marking whichIt contains information about the operational characteristics of this type of finishing material. Do not be shy advice from the seller about the unknown and obscure icons on this label. This will prevent many unwanted effects of purchase. Thus, the choice of wallpapers for the dwelling is a rather responsible process. Competent approach which will make any room a cozy and comfortable.